A few months ago, while attending a free seminar in Investing in Stock Market courtesy of Mr. Juanis Barredo, Vice President of CitisecOnline / Citi Securities, Inc. who introduced us to a lots of concept in this type of investment. It was not a get rich quick scheme but creating awareness on this type of investment where people never had engaged on. 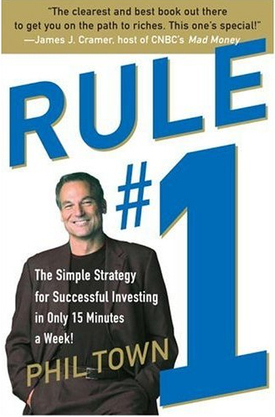 He gave us some list of books to read and ponder before going to stock trading until he recommended to us Rule # 1 by Phil Town. Who is this Phil Town? I never heard of him in my entire life. I became wonder what this author does so I decided to research first before buying this book and eventually went to the closest specialty bookstore like Powerbooks in SM Megamall and was priced at more than a 1,000 pesos for a hardbound. I only need a softbound copy which cost a fraction of that at PhP 695.00 at the nearby National Bookstore. I am happy and content on finding a copy of Phil Town's book. Before becoming a famous author and investor, Phil Town was a former Special Forces soldier in the U.S. Army who served during the Vietnam war of late 1960s to early 1970s. After his tour in 'Nam, he returned to the United States to find out that many people despise the troops coming home and have unwelcoming remarks due to the anti-war sentiments on that period. With no work and having difficulties adjusting to civilian life, he did odd-jobs at that time until he became a river guide at the Colorado river with a outdoor tour company called Three Rivers (see Video). A rule that Mr. Phil Town has kept on his mind in a very long time and has been telling the readers ever since the conception of his book, Rule #1. The same principle as what Warren Buffett does. Understanding first the company that interests you and analyzing their pros and cons in investing in them by establishing the MOAT. Checking out the internet and find the gems which were thrown to the trash. Markets are harsh but somehow you can find a good find on those companies that can generate income in the future years.